Interior Design 3D is a convenient program for 3D home design. It will be of great help to you whenever you decide to redecorate your house. Customize your floor plan, arrange the furniture, experiment with textures, and view the result in 3D! Convenient software for making ID photos for passwords, visas and other documents. Automatic face detection, database of ID photo specifications, photo editing toolkit, shadows correction, changing photo background. Available for home and business use. Award-winning application for designing professional-quality calendars in any language. Make calendars of any type: wall poster, spiral-bound, booklet, pocket, desk calendars etc. Export to JPEG, PDF, TIFF (CMYK), or print with 300/600 dpi quality. Easy software for making picture collages and digital scrapbooks. Truly user-friendly - all things done with drag & drop! Plenty of picture frames, photo filters, masks, and clipart. 350+ page design templates for a quick start. Powerful PC cleaner - remove junk files and fix various system issues in a click! 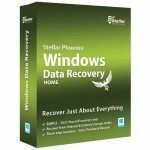 Stellar Phoenix Windows Data Recovery is your best disaster recovery solution to get back all your lost and deleted files, photos, music and videos after all event of data loss like accidental deletion, disk corruption, or storage media formatting etc.